Whatever great cell phone you have and whatever powerful camera it has, it won’t be able to contend with high-end cameras from Nikon, Canon or any other representative of the elite photography world. So if you belong to real connoisseurs of high-end cameras then don’t miss a chance to look through the list of best offers one can find at today’s market. We’ve prepared the list of the best digital cameras, which include the best examples of DSLR, mirrorless, point-and-shoot as well as waterproof cameras. If novices are looking for cameras with impressive megapixels, real pros are in search of cameras with hefty sensors. The larger a sensor is the better quality of images you will get – this is probably one of the main principles which should be followed while choosing a digital camera. And don’t let megapixels addle you. The second feature, which demonstrates how cool a camera is, is the quality of its lenses. Nevertheless, here you should always take into account the purpose of your purchase. Are you going to shoot various social events like weddings and parties, or are you aimed at the sports life? This factor plays one of the key roles while choosing a suitable camera. A good camera usually has a great number of autofocus points which have a crucial impact on image accuracy and sharpness. Besides, a shooting speed should be enough for capturing fast-moving subjects. This feature shows in what lighting conditions you will be able to take photos. The bigger ISO range is the more lightning conditions a camera can tame. Some other features, which will make a camera a special one, presuppose weather sealing. Besides, it can be water- and dust-proof. A good camera will also provide you with a quiet shooting mode and high-level automatic settings. Expensive but at the same time one of the heftiest cameras of nowadays, Canon EOS 5D Mark IV is definitely worth your attention. Its 30.4-megapixel Full-Frame APS-C CMOS sensor is an improved version of its previous Mark III model. This sensor provides 100-32,000 ISO range, which can be also expandable up to 50-102,400 equivalents. Note that it’s namely 150,000-pixel RGB+IR metering sensor which makes it possible to get precise exposure metering and detect flickering lights. Canon EOS 5D Mark IV has also got 61-point autofocus. Its DIGIC 6+ image processor provides fast focusing and a general shooting speed of 7 fps. By the by, there is great “Silent” shooting mode, which offers noise reduction at high ISOs. It allows you to stay completely unobtrusive during the shooting at different social events. Besides, keep in mind that this Canon version is a good choice for shooting under various light conditions. This representative of DSLR cameras can also boast of impressive video performance. The point is that Canon ESO 5D Mark IV is able to capture movies in 4K 2160p Motion JPEG. Its other features cover such video options as Full HD up to 60p and HD up to 120p. But these are not only a sensor and processor that make this Canon camera so much popular. Its general look has also played its part. Canon ESO 5D Mark IV is easy to use as it has a simple menu and a good arrangement of buttons. It also offers full touchscreen functionality. Wi-Fi and GPS are available as well. If you’re in the market for an outstanding entry-level camera from Nikon, the D3500 is well worth a look. It won’t break the bank, and we think you’ll be impressed by the number of features this DX-format camera brings to the table given the price tag. We’re going to start with the tech specs for the Nikon D3500 as you’ll get a 23.5mm x 15.6mm 24MP CMOS sensor. The camera has both manual and autofocus modes, and AF comes with 11 point phase detection. As for the viewfinder, it’s a pentamirror with 95% coverage and a magnification range of 0.85x. The rear panel clocks in at 3” with 100% coverage and is fixed. This particular model has an 18 – 55mm lens with a maximum aperture of f/3.5 to 5.6. The minimum is f/22 to 38, and it comes complete with AF and image stabilization. The D3500 uses the Nikon F mount system in case you want to swap out lenses out or have some already in your bag. It doesn’t have Wi-Fi like most modern DLSR’s, but you will get Bluetooth. While the Nikon D3500 is missing a few features found on more expensive cameras, it’s one of the best cheap DSLR cameras you can buy. We mean that in a good way as you’ll get a lot of value from this one; just keep its limitations in mind along with your needs. It’s rare to find a DSLR with glowing reviews across the board, but Nikon has seemingly done the impossible with the D850. It’s a Pro-level camera that will put a dent in your bank account, but it’s well worth it if you truly want the best. With the D850, it all starts with the sensor which is 45.7MP with an automatic ISO range of 32 to 102400. It’s a back-side illuminated sensor as well, a first from the company but something we expect to see more of in the future. The camera produces rich photos, works well in low light, and has a handy silent mode to go along with an excellent AF system. The advanced autofocus system on the D850 has 153 focus points with 99 cross-type sensors. It’s accurate, and fast thanks to a dedicated chip. The tilting touchscreen with touch AF is a perk as well, and nobody will complain about being able to record 4K videos at 30p in full-frame with that sassy sensor. The time-lapse feature is also noteworthy if you want to play with 8K stills, and the battery life is simply outstanding at over 1800 shots. If you’re in the market for a camera with a massive sensor and battery life to get you through the day, the D850 won’t let you down. There are enough modes and settings to keep even the savviest photographers busy although it’s not a camera we would recommend for consumers just getting started in the hobby. Sony has a half-dozen cameras that could have taken this spot considering they make some of the best cameras around, regardless of the class. Our favorite all-around pick from the company is the RX100 VI, a camera that also made the cut on our best compact camera list. Want to add an extra layer of depth to your photos or videos of the family’s trip to the Magic Kingdom. Well, the Sony RX100 VI can accomplish both of those tasks with ease thanks to a slick sensor & lens combo and some high-end tech specs. It all starts with the large sensor however which is a 1” stacked 20.1MP Exmor RS CMOS. This responsive camera has an ISO range of 125 – 12800 and can do continuous shooting at 24 frames per second. Optical SteadyShot will ensure clear photos at extended range, and your videos will shine with features like 4K recording and super slow motion. We’d be remiss if we didn’t mention the touchscreen as well, considering it swings up or down depending on your needs. It’s hard to argue with what the Sony RX100 VI can do, and there aren’t many drawbacks if this camera falls within your price range. We do wish it had an external mic port and the display was a bit more articulated, but it takes razor-sharp photos and is pocket-friendly to boot! If you weren’t impressed with the compact RX100 VI, the Sony a7 III might be more your speed. It’s another camera in the “Pro” class and one that’s available in bundles built to suit any photographer’s needs. Sony went with a back-illuminated full-frame sensor for this camera which clocks in at 24.2MP. Image stabilization comes through a 5-way sensor-shift system, and it’s capable of 10 fps continuous shooting. We’re also fans of the AF joystick and connectivity options which include NFC, Bluetooth 4.1, and Wi-Fi. Throw in a slew of ports, and you’ve got yourself an affordable full-frame camera with plenty of pop. The Sony a7 III may not have the largest sensor or as many features as flagship cameras in this class, but it’s widely regarded as one of the top models around. The base model comes with a shoulder strap, a few caps, and a cable, but you’ll need to pick up a bundle if you need a lens or want more accessories. 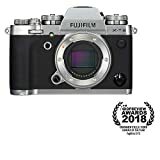 In case you are looking for a camera with an option of 4K video recording but spending more than $1000 on it is too much for you, then pay attention at Fujifilm X-T20. Well, this is not a super cheap camera but its price is worth all the features it has. Fujifilm X-T20 is fast. Its continuous shooting speed reaches 8 fps and 5 fps during live-view shooting. By the by, it also provides Interval Time shooting and Film Simulation mode. Another thing you have to know about this camera is its great variety of exposure modes. Full manual mode is included too. Having X-Trans CMOS III Sensor and X-Processor Pro this Fujifilm camera doesn’t contain any optical low-pass filter. In fact, such combination results in fast read speed and great AF tracking. Still, keep in mind that Fujifilm X-T20 hasn’t got any weather sealing, so be careful when shooting at the seaside or under the rain. Why is Olympus OM-D E-M10 Mark III in the list of best digital cameras? The answer is quite simple. This Olympus camera is fast and compact, it produces high-quality images as well as videos and it has a reasonable price. In fact, it sounds like a camera of anyone’s dream. Its 16.1 MP 4/3 Live MOS sensor is responsible for high-quality images. Its 8.6 fps continuous shooting speed means accurate photos of fast-moving objects. And the 5-axis image stabilization reduces any blurs caused by shaking of your hand. Olympus OM-D E-M10 Mark III supports 4K video recording and can offer up to 15 art filters. Its articulating touchscreen includes an option of a Touch AF what makes the display quite intuitive in use. Besides, this digital camera has a built-in flash and an option of a remote control with a smartphone. The GoPro has been around for over a decade now, and with each generation, the company brings something new to the table. Their latest camera, the GoPro Hero7, is a welcome addition to the lineup and a great digital camera for action cam aficionados. If you’re new to the world of GoPro, you’ll want to know this one is geared more towards video than photos. It only has a 12MP CMOS sensor, but can take 4K video at 60p – something not many other “cameras” can do. It’s no slouch in the photo department thanks to the intelligent SuperPhoto mode which adds a layer of depth to otherwise bland photos. When it comes to video, you won’t be disappointed with the GoPro Hero7. As mentioned, 4K is a lock, but you get features like TimeWarp video, 8x Slo-Mo, and live streaming. You can share your journeys straight to Facebook Live or save them to an SD card to view at a later date. Other killer features include voice control, HyperSmooth Stabilization, and a touchscreen display. This camera is waterproof up to 33 feet and can take a bit more abuse than your typical compact camera. As mentioned, this slick camera’s primary function isn’t necessarily taking family photos, which will rule the Hero7 out for some unless you’re a very action-oriented family. It’s not a budget item and it doesn’t have an option of 4K video recording. This camera isn’t waterproof or even weather-sealed. Still, despite all the pre-cited drawbacks Fujifilm X100F remains one of the best digital cameras on today’s market. This Fujifilm camera has a periodic color filter array and, as a result, needs no optical low-pass filter. Due to the noise control, gained through increased pixel count, it has got a wider ISO range (up to 12,800). Apart from this, it’s equipped with a built-in ISO Dial. Thanks to expended phase detection area there is an option of phase detection AF as well. Fujifilm X100F is simple in use and has a compact size what is really important when traveling. This digital camera has fast autofocus with Focus Lever and Advanced Hybrid Viewfinder. There is also an option of in-camera RAW conversion, built-in Wi-Fi and ND filter. By the way, manual focusing and exposure are available too. This Sony camera is considered to be a true legend thanks to its fast performance. RX10 IV has the fastest AF acquisition time in the world – only 0.03 seconds. Furthermore, its continuous shooting speed is also great and reaches up to 24 fps. Note that it includes with full AF/AE tracking as well. However, it’s not only a 315 point phase-detection AF system and great speed that make this product one of the best digital cameras. There is also unique Sony optical stabilization technology that prevents any blurs in the photos. Obviously, that all the pre-cited features result in great image quality. Due to 4K6 mode as well as super slow-motion mode, video recording is another advantage of this camera. Sony Cyber-Shot RX10 IV is a reliable camera. Unlike Fujifilm X100F or Fujifilm X-T20 it won’t be frightened by raindrops as it has got environmental sealing. As to the battery life, it won’t disappoint you as well. Looking for a high-end camera that excels where others fall flat? The Canon EOS R certainly fits that bill, and while it’s one of the more expensive cameras on our list, the specifications should speak for themselves. This decked-out camera falls into the full-frame category with a massive 30.3MP CMOS sensor. The ISO range is listed at 100 to 40000 but expandable from 50 to 102400. It also has electronic and manual shutters, so you can get the best of both worlds, and the autofocus system is in a class all by itself. Canon’s hybrid autofocus system has 5,655 points with manual, single-servo or continuous-servo focus modes. The EVF is top of the line at 0.5” with a resolution of 3.69M-dot and provides 100% coverage. We’re pleased to say the LCD panel is just as slick, is a touchscreen and rotates to suit your needs. While there are a lot of settings on the EOS R, the multi-function bar and LCD panel across the top help simplify things significantly. The EOS R is a camera a lot of fans were waiting for, and while it gets a lot of things right, there are a few missteps along the way. Other cameras at a better price can handle 4K better, and the burst shooting speeds were a little disappointing as well. Overall, it’s still an excellent camera that delivers stunning photographs; just keep the price tag in mind along with your needs. Mirrorless digital cameras are something almost every manufacturer has in their arsenal these days, but the X-T3 from Fuji is one of our favorites. It’s an excellent compact camera depending on your lens, and it can do a few things cameras twice the price can’t accomplish. Whereas the Canon EOS R and a few other high-end cameras let us down in the video department, the X-T3 is ideal for folks that deal with video. That’s because it can shoot 4K at 60p in 10bit at 4:2:0 internally or 4:2:2 through HDMI output. Rolling shutter distortion is reduced, and the 10bit depth really makes a difference regardless of the subject matter. The sensor behind the magic is a 26.1MP X-Trans CMOS sensor which is backed by the company’s X-Processor 4. It’s peppy, and if you’re a fan of 35mm film, you will dig the “film simulation” modes which give your snapshots a unique look. Other flagship features of the X-T3 include a 3.69M-dot OLED EVF, Sports Finder mode, Bluetooth, Wi-Fi, and ports for both headphones and an external mic. The Fujifilm X-T3 may not have as many focus points as some of its competitors, but it takes sharp snapshots and is your best bet if you’re into shooting 4K video at a reasonable price. This camera is available in Silver or Black with the body only or in a bundle with one of several lenses. If our other options from Nikon weren’t your cup of tea, the Nikon Z7 might be just the thing for you. It’s an FX-format camera with specifications that will make you drool. It has the largest sensor of any camera on our list and is a serious piece of equipment. Before we get to the specs, we want to talk about the features of the Nikon Z7. This 4K camera can do 8K time-lapse or brings things to a crawl with slo-mo video. It can be an acquired taste, but the icon-driven display set in the viewfinder is something we wish more cameras had and this one allows you to customize the menu. Whether you’re tracking a subject or just need to focus on a face, the Z7 has 493 AF points which take care of 90% of the frame. The hybrid system is quick, and you’ll be impressed by what the big 45.7MP FX-format sensor can do. The ISO range of this camera is listed at 64 to 25600 or 32 to 102400 in extended mode. You’ll also get access to the SnapBridge platform as this one has Wi-Fi and Bluetooth. The Nikon Z7 may be a bit of mixed bag depending on what you’re looking for from a camera, but there’s a lot to like if it’s within your budget. That includes a tilting 3.2” LCD panel and that cool icon-driven display system along with top-class stabilization. We chose the combo with the 24 – 70mm lens, but you can also scoop this one up without a lens if you want to save a few bucks or have one ready to roll.